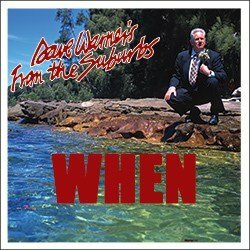 A double CD released in December 1999, Suburbs in the 70s features original live recordings of Dave Warner’s From The Suburbs, circa 1978. Many of the tracks were compiled on audio cassette and sold at live gigs in the late 1970s, under the banner The Victoria Tapes, and were later recorded for Mushroom Records. The Victoria Tapes were, in fact, recorded at Perth’s Victoria Hotel in June 1977 and at the Shenton Park Hotel in December 1977. These CDs reveal the raw power, the rough evolving sound of The Suburbs, and the total originality of Warner’s music. For years, Warner fans have heard the line that Radio Birdman and The Saints were the seminal new wave bands in Australia, knowing that their body of work was dwarfed by what Warner had happening in the West. Suburbs in the 70s is a must for all Warner fans and all collectors of Australian music. At least a couple of the tracks must have been recorded slightly later than December 1977 because Tony Durant (The New Boy, Guitar and Pedal Steel Guitar), Paul Noonan (Bass) and Howie Johnson (Drums) can be heard on them. The tracks were remastered by Paul Bryant and Martin Cilia.